These are excellent questions. In the email industry, deliverability and engagement rates are key. If people aren’t receiving the email and acting on it, what’s the point? But when comparing and trying out a new email service provider (ESP), you have to expect differences in your engagement rates. The kicker is to know what these differences mean and how to accommodate for them. The most obvious difference between the open or delivered rate is how the ESP defines those terms. For example, GetResponse will count someone who clicked toward your open rate, since that’s evidence they’ve opened the email as well. There’s also different formulas for open and click rate, which can vary if you’re calculating the opens out of the “sent” total (total of original recipients) or the “delivered” total (total of original recipients minus bounces). 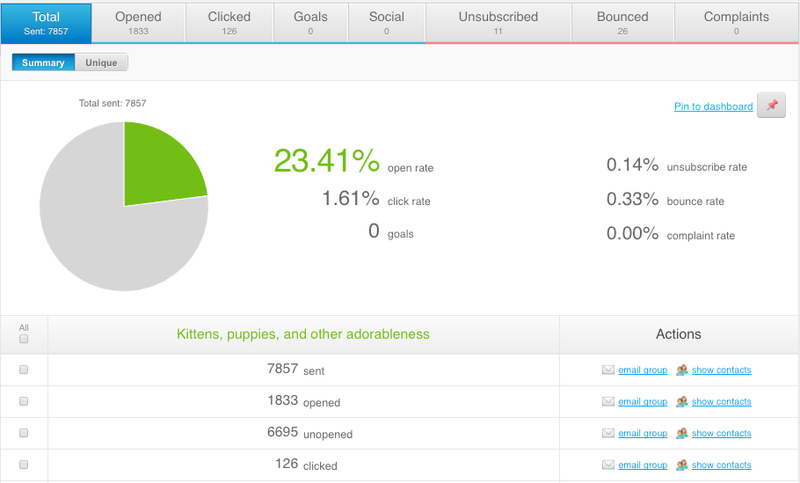 GetResponse calculates your engagement rates based on what actually delivered. A less obvious difference is in how the ESP processes and categorizes bounces. Since many receivers send unclear or deceptive bounce replies, ESPs fine-tune their bounce processing to make sure responses are categorized correctly. This means that often a “bounce” in one ESP may be classified as a “delivery” in another. For example, a bounce reply with the code “550” should be a hard bounce, but if the receiver sends “550 please try again later”, an observant ESP should adjust bounce processing to make sure messages like this are attempted again. Of course our hardworking Deliverability Team pays attention to these details to give you the most accurate message statistics possible, but it may mean you see more or less bounces if you’re trying out multiple ESPs. Believe it or not, your email content has an identity of its own. A content’s “fingerprint” represents any combination of sender info, phrases, URLs, footer info, image hosting, etc. that when fit together easily identifies you as a sender. This means that even if you’re using a new IP, many receivers might still recognize your content as something they’ve seen before. Sometimes this is a really good thing. If a subscriber has been highly engaged in your content, its fingerprint may keep that email going to their inbox even after you’ve switched IPs. But sometimes this is a bad thing. Receivers were used to you sending over a specific range of IPs, but now the IPs have changed. Is this really you? Are you trying to hide from something by changing IPs? To be cautious, some receivers may (at least temporarily) send more of your messages to the spam folder. To help combat poor deliverability, I can’t recommend enough to try A/B testing. If you’re looking for more than just opens and clicks (maybe purchases, replies, etc? ), GetResponse lets you choose to manually review and select the “winning” content, giving you tons of insight into both the preferences of your subscribers and spam filters. With your most engaging content, a new ESP’s good reputation can help boost your deliverability instead of bringing it down. Obviously when you switch ESPs, you’re now sending over a different set of IPs. This reputation is a lot like the reputation we build as people — it’s based on things you’ve done in the past and who you’re associated with. For an IP, receivers are looking to see what kind of email it’s sent in the past and what other IPs associated with it are doing. Of course every ESP has a different reputation, and you’ll probably send over different IPs throughout the life of your account. At GetResponse, the IP you’re sending over is shared by other GetResponse users, all under the “getresponse.com” domain. Our Compliance Team does an amazing job keeping only good senders in our system, and that’s given us a good reputation with receivers. On top of that, our Deliverability Team monitors blacklists and bounce reasons to make sure each IP is performing at its best. We’re constantly communicating with receivers and our partners in anti-abuse to keep on top of industry standards and innovations. GetResponse customers will be able to use this good reputation to their advantage. Just remember that there are some drawbacks to switching to an ESP with a better reputation. It could result in more unsubscribes and spam complaints, since those messages are now arriving in more inboxes for people to “negatively” engage. A better reputation means more visibility into what needs improving. Rather than trusting the results of a few test sends, look for an ESP with a knowledgeable Deliverability Team and a responsive Compliance Team. I know I’m “tootin’ my own horn” here but, it’s these factors that will keep your deliverability rates dependable and be able to offer you actionable advice for the future.